Children of the Prairie Fire Organizing Committee protest imperialism. When I tell other activists in the San Francisco Bay Area that I was a member of Prairie Fire Organizing Committee (PFOC or PF) in the 1970s and 1980s, 1 they often say, “Oh yeah, you’re the people who always had child care at your events.” People who knew us better knew that we also shared child care among our members and had a political kids group that was mostly our children but included a few others. Our small organization was a village that raised almost forty children over twenty years. We didn’t do a perfect job —our grown kids are quick to tell us where we blew it, but also to acknowledge how it made their childhoods richer, more meaningful, and more secure. At the same time, we made it possible for parents to participate fully in our collective life and for all of the adults to have meaningful relationships to children, relationships that translated our commitment to feminism into the practical work of social reproduction. In this period, when progressive activists are trying to figure out how to organize ourselves to deal with the challenges ahead, it’s important to think about where children fit in. How can we nurture our communities’ children while ensuring that parents, and especially women, are able to participate fully? For much of recorded history, children have grown up in villages or towns with tight-knit social relationships, where everyone knew them and had a role in their upbringing. The kids knew the boundaries, and expected to be supported and chastised by everyone. The myth of the idealized nuclear family, two parents and one or two children, was widely propagated in United States after World War Two. My generation, born in the 1940s and 1950s, were parented by that generation of nuclear family parents. My generation became active supporting civil rights, opposing the war in Vietnam, and developing a feminist consciousness. Like many other radicals, we organized a small, disciplined organization of a type that flourished in the 1970s but is rare on the Left today. We considered ourselves communists, an organization of dedicated cadre for whom overthrowing the US empire was our highest priority. We studied the Marxist, Leninist and Maoist classics, but were not aligned with any formal communist tendency, and looked to neither the Soviet Union nor China for direction. Most of us were members of Bay Area public activist movements. Some ended up in prison for our actions and beliefs, and others were underground for years. We were united by an anti-imperialist politics that saw white supremacy as foundational to the U.S empire, shared the rudiments of a strategy for overthrowing U.S. imperialism, and adhered to a high level of collective accountability in our personal lives that included a commitment to raising our children. We didn’t want to replicate the experience of the Communist Party, where women were either completely overburdened or they were never around and the children felt abandoned. There are many children of the Communist Party who felt that their parents were lunatics, or women who felt like they couldn’t participate in political activities, because, of course, it was their job to take care of the children. Under imperialism, women’s oppression has become defined within the framework of their double function: as unwaged reproducers, socializers and maintainers of the labor force in the home; and as super exploited members of the wage labor force, primarily in the reserve army of labor. These oppressive functions are maintained and reinforced by male supremacist institutions, ideology and privilege which extend into every area of women’s lives: political, social, cultural, psychological, and sexual (p. 29). Our women’s caucus was both a political and a personal support. We supported gay liberation when much of the left considered being gay a disease of empire. We always supported, argued with, and participated in the autonomous women’s movement. Further, we were determined to practice feminism in the daily life of our organization. Parents, especially women, were full participants in our collective’s very demanding array of tasks and activities. Collective child care was a practical expression of our feminist politics and a political responsibility, as important as participation in our strenuous schedule of meetings and actions. Our collective child care was more than a practical matter, and more than just a belief that “the children are our future.” We saw social reproduction, “women’s work,” as the work that knits human communities together. We wanted all of our members to participate in work that we saw as crucial to building revolutionary consciousness and making revolution. As a new generation of activists is wrestling with questions of organization and strategy, I would argue that we need to look at how to build our movements to prefigure the world we want to see while we are fighting for racial justice, immigrant rights, women’s liberation and the rights of gender non-conforming people. This essay describes what we did in PFOC in the San Francisco Bay Area and reflects on its relevance to today. Child care teams were organized for every family, and every member of PFOC participated. Our practice evolved over the two decades of our organizational existence, but the basics stayed pretty much the same. A child care shift, usually weekly, could involve picking up one or more kids from school or after school activity, helping with homework, making dinner, overseeing bath and bedtime. The teams usually had from three to five members depending on the adult/child ratio at the time, which meant that parents were free three to five times a week to go to meetings or other activities of our lives. We helped manage weekend activities; when we had programs or activities we always provided child care, not only for ourselves but for anyone who participated. The childcare teams were our effort to create a village for the kids. When I picked up my charge from school or day camp I would joke that I was part of her “vast entourage.” We wanted the kids to know that they had people they could call on, talk to, ask for help. The testimony of the grown children confirms that most of them felt that support, felt welcome in the world. They criticize us for our shortcomings, but also recognize that they had more support than most of their peers. They are a pretty confident, competent bunch, most have warm relationships with their parents and have kept friendships with many members of their child care teams for more than 30 years. For the twenty years PFOC was part of the Bay Area Left, about fifty of us raised almost forty kids. Today the oldest are approaching fifty, the youngest are not yet in their teens. We have a handful of grandchildren, and in a lot of ways resemble any other crew of aging white radicals. Many of us are teachers, writers, and still activists. We still participate in solidarity work with Haiti and Palestine, march with Black Lives Matter against police terror and for women’s reproductive justice and LGBTQ liberation. As a participant in today’s movements, I see that parents, especially women, are facing the same obstacles to full participation that we saw in the 1970s. Left groups do not have a perspective that includes child raising. One of the great things about having a child care team was for kids to hang out with adults that are going to expose them to things and talk about things with them and take them on adventures and have energy for them that their biological parents might not. Being around adults who said I have energy for you and I have time for you and I want to focus on you and take you places and hang out with you. Annie would tell these epic stories about the Roman bourgeoisie who were gluttonous and would go into the vomitoriums and throw up so they could eat more. And then the maids had to go in and clean up these horrible vomitoriums and found these precious jewels and ran away and lived forever on these rings. Really creative wonderful stories that were very political that I just ate up. A lot of people talking about how you did on your math test and whether you can tie your shoes or the age you were potty trained, it puts a lot of pressure on you. The level of awareness of other people’s opinions about me from a very early age. I’m a very private person because I’m very aware of other people’s opinions and criticisms and judgment. I really keep things very close. I don’t expose myself very readily. Privacy that I’ve clung to as security. We lost [one person] because he left the community. I remember asking about it. I remember my mom saying he’s not going to be a part of PFOC any more and her saying he wanted to be more with the gay community. Some part of me got that, but I asked if he was going to be around for us. And she said yes, but I don’t think he was very welcome in the scene any more. I grew up with a lot of black kids, and this way of having family wasn’t that dissimilar from the way that their families were. The people I felt most uncomfortable with were other white kids, because there was still such a pressure for hetero families. But the black kids I hung out with would say, oh this is my play cousin. And I could say I have some of those too. It was a language for me to express what you all were. I remember begging my parents, ‘what are these people to me because they are not just my friends?’ I couldn’t use the word comrade, but that was another way to say it. That was my play sister. The kids I interviewed had a sense of being welcome in the world. Their confidence arose from their sense of being welcome in multiple households. They had a sense that by and large they were raised by people who listened to them, that were in their business. Some kids didn’t like that there was a lack of privacy at times, but they also learned how to speak their minds with adults at a young age because they had to. And there was actually support for them speaking out. The folks who raised them were rather remarkable people in themselves, and I think that some of that rubbed off. We organized political education for our growing pack of school-age children. They called it the Red Dragons. We showed them movies like Roots and Eyes on the Prize. The kids disrupted Toys R Us during the holiday shopping season with a demonstration against war toys. Red Dragons was our effort to engage the kids in our political work, led by PFOC members who worked in child care centers or the public schools. When we look back on it now, I think many of us agree that we were pretty top down and dogmatic, and that if we had it to do over again we would have listened harder to the kids. Our most successful campaign with them was Pennies for Pencils. People had just returned from a delegation to El Salvador in 1984 and told the kids how poorly equipped the schools were, mentioning that the kids there didn’t even have pencils. Our kids responded: “We brainstormed what we would want to give the kids in El Salvador, and we probably got help with that. Somebody helped us learn about the lack of school supplies … I remember being really excited about that.” We mounted a campaign with the idea of collecting money for pencils. They had a booth at neighborhood fairs (pin the tail on Reagan) and canvassed door to door. The kids raised more than $1,500 in three years and sent tens of thousands of pencils to El Salvador. 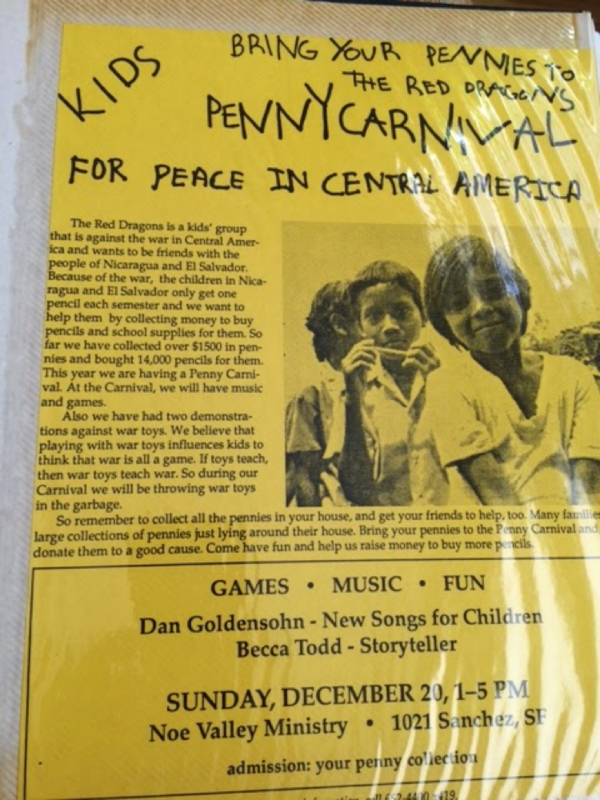 Flyer for PFOC children’s solidarity project. The reactions of the grown children to their memories of the Red Dragons ran the gamut from negative to positive, with polite ambivalence a common response. I do understand the parental compulsion to give children a worldview that incorporates one’s own values, and you guys had solid ones, for the most part. I just don’t think most of the adults involved knew how to handle the responsibility in a way that was conducive to a child’s understanding and development. No one on my child care team was part of Red Dragons, so nobody was invested in my emotional well-being except to make sure I came home with all my teeth and wasn’t hauled off to juvenile hall. I don’t blame them. We were thrown together in ways that weren’t very organic. I have really fond memories of playing with all of these kids; we have some great pictures of all of us. But as we got older it got a little meaner. And as we perceived the larger social setting we were in, we also reflected the social structure of the organization and of our parents. It wasn’t that we were friends and had a play date. It was that our parents were doing political work, and we were doing political work. I loved the Red Dragons. I remember a lot of kids. Me and [my sister] would tease each other, oh boy are they really training us for something, indoctrination, contrary to what our parents might say now. I loved being around all these kids, I felt like we were a family, we were learning something in a pretty fun way. We went on camping trips, we did all this pretty cool stuff. We learned really important things about race and gender in the Red Dragons, and about what it meant. We didn’t have to unlearn the myths about the perfect U.S. democracy later on. Visiting prisons and visiting the people that I knew in prison were probably some of the most powerful experiences I had when I was a kid. It made me really angry because they couldn’t walk out with us at the end. I think kids really want to figure out what’s fair or not, and it didn’t seem fair that these people who were so amazing and who either did nothing or did something that I thought was justified were in prison for the rest of their lives instead of out with us. Talking to the grown kids convinced me that our child care practice gave them an overall understanding of social justice and confidence in their capacity to participate in social change. None of them has wholly rejected our political perspectives, although they are not all activists or organizers by any means. And as they have their own children, they echo some of our child care arrangements, although they tend to be structured along more traditional lines (calling on us as grandparents, etc.). The parents were of course glad to have the support of child care teams. Some felt they didn’t get enough support, especially the ones who had children later when we had more kids to take care of and were less tightly organized. And some admitted to wishing they could spend more time with their children and resenting the children having other significant adults. As one parent put it, “I wanted those little arms reaching out for me.” Everyone talked about the challenge of finding a balance between collective discussion of the kids and the need to make final parenting decisions. I knew that in the long run most of those parents were going to be with those kids, but that many of the people on the child care team were there for this year or that year, as long as their assignment lasted and as long as they were involved with Prairie Fire. It’s what I understand about my role as a professional child care provider. I can be with kids 40 hours a week, but I’m going to be with them for a couple of years. It’s their parents who are going to be with them for the long term. I became a parent kicking and screaming. But then I got to the point where I didn’t want our daughter to go to another house, I didn’t want her to go for two weeks to Maine with people on her child care team. I wanted to be with her. But that wasn’t what people signed up for. If I wanted this to be a child care team, I had to give up my privilege or my power or my position as primary parent. Letting go of that was hard, it wasn’t something I wanted to do, but I knew it was what was best for her. These unique familial units had other unintended effects. For instance, they mitigated the pain for the kids when parents separated. Because we tended to couple within the collective, our kids did not usually lose a parent when the parents separated. (Collective support and pressure for the grownups was also a factor; our breakups were for the most part very civil.) If anything, the child care teams grew and changed as the kids rotated between houses. But to a remarkable extent, the security of our children was not dependent on the personal relationships of their parents. The child care team was an invaluable asset in managing divorce. Not just because we saw other people break up and still have this family structure, although that’s a big thing that I got out of the whole thing, but also because you need help sometimes. My breakup with [my partner] was in part a product of some of the dysfunctions within Prairie Fire. But in the same way that a collective structure put a lot of pressure on a family, the sense that we were a family even if we weren’t together was never questioned for us because we had this structure. I definitely noticed that my parents getting along better after they were separated was very beneficial and that was the most important thing. They seemed to get along better after they were separated than when they were together. I remember as a young child, 7 or 8, other friends saying I was rich because I had two houses, especially since they were living so close to each other. Collective child care posed challenges for the parents, as people not biologically related to their children formed relationships with them and had opinions about them. We did not have clear guidelines, so one team might decide it was appropriate to argue about what middle school a 12 year old should attend, while on another team, the parents might be completely in charge, with the rest of us viewed as helpers. At a minimum we relieved our parents of the burden of being the only adult models for their children; some parents actually constructed families of a new type with non-parents, families that have lasted to this day. The most surprising transformative impact of our child care practice was for the non-parents. For me, as for many of the non-parents, collective child care not only deepened my feminist politics, it changed my life. I come from a big family, saw my mother give up her personal ambitions to raise us, and was unwilling to be some child’s only or even primary role model of motherhood. Nor was I interested in becoming a preschool or elementary school teacher. But I like kids, care about them, and knew that raising children was vitally important work in the world. I did childcare for several of our older kids, and became a third parent for our daughter, who I have known since she was conceived almost 40 years ago. Early in the interviewing process for this project, I realized that many of us non-parents had our own versions of my transformative experiences. Some of us made new families that included the non-parents (at least three such families). Others went from the childcare teams to bear or adopt their own children: a dozen heterosexual couples, and half a dozen lesbian couples in and around PFOC. Two single men, on straight, one gay, and one woman adopted. When I took the step of joining PF I knew this would be part of my duties, and I saw it as a duty. …It takes about half a second before you realize this isn’t a duty, it’s about developing a relationship with this kid, with children. Once that shift happened, it’s magical. Once you make that shift and you’re really relating to a kid, then you can relate to any kid…you can become a teacher! Where’s the payback [for us]? PF’s not around any more, I have these two young children, but really the payback, the reward was intrinsic, at the moment. It didn’t occur to me to have a relationship to children, because one of the things about being a gay man is that you didn’t have a relationship to children…. One of the great things that Prairie Fire’s collective child care and the Red Dragons gave me was the knowledge that I loved kids. I didn’t know that because that wasn’t a thinkable thing before. I highly doubt that it would have happened if I had not had the experience I had with kids in PF and learned, a. I liked it, and b. I could do it. …A lot of people I knew were dying. A whole set of gay men that I had come to find myself with were dying. And in that way that death and new children are part of a cycle…. I had zero experience of kids before PF… had no interest in being around kids and no experience raising or helping with that.…One of our agreements [in my relationship] was that we weren’t going to have kids, because I didn’t want to have kids. She agreed politically but not personally…I couldn’t say no, but my condition was that we were going to live collectively. I don’t think I would have wanted to have kids in a different context at that time. Having the collectivity allowed me to be open to that possibility…It wasn’t just the political line, the project, we all do child care. It wasn’t just opening up time for women to be out in the political world because they didn’t have to be with the kids all the time. It also allowed me to not be taking such a personal risk to the rest of my life goals. Our child care model worked because we were dedicated to a larger political goal and childcare was a condition of membership. Many of us were not ourselves parents, and we subscribed to a feminist politics that defined collective child raising as essential feminist practice. Our model became a challenge as more of us decided to become parents and there were fewer non-parents to populate the teams. Our later parenting models look more like today’s parent co-ops and play dates. By the mid-90s our organization had failed to grow; we disbanded in the Bay Area. We lived with someone on a PFOC child care team. The child spent the night at our house once a week and we got to know the whole extended family, her mom and all of them. They introduced us to the Prairie Fire model of the child care team, so we had a little gathering of folks who were interested in this idea. Some of the Prairie Fire folks told stories about what it was, what they did and how it worked. Then we started a child care team for our first child. We had a fairly big crew in the beginning, that whittled down to four or five. Many of them have stayed really close in our lives. They would take her out for walks, or come over and spend time with her. That would give us time; it was a foundation for us. And also for her. It was a way to provide her with other adults. When the baby was born we didn’t cook for a month. People would come over, hold her, do our dishes. It was about people coming over and being helpful, but also having a relationship. It started with organized child care, and as she’s gotten older it’s transmuted into a large family. She’s got a lot of aunties and an uncle. Some of them don’t see her as much but they’re still her aunties and uncle. They will take her and a friend and go do stuff with them, so that they have become part of her family. The other thing that we did was … [at her preschool] she became friends with these girls and we became friends with their families. We have supported these girls since they were two years old to continue their friendship and to continue our relationship with these families. We helped one family when her dad died. The girls go to different schools but they see each other every summer. They have birthday parties together. I recruited the families to start a coöperative day camp. Since kindergarten we have spent one to three weeks each summer taking turns having a day with the kids in a model that’s not so fundamentally different than a child care team. We all pay lip service to the importance of the next generation, the importance of education, safety for children, blah blah blah. But it’s not until we ourselves become parents that we actually start to want to do things about it, but then because it’s just us, we are peeled away from the mainstream of the movement and have to figure it out on our own. And that happens over and over again. It was probably happening in your generation, it’s happening with people younger than me. And because we each decide to have a child when we decide, the people who become acutely aware of the need to change how we raise children are the people who do not have the capacity to make that change happen. One of the primary goals of the childcare collective is to provide support for working class women of color leaders in the movement through organizations like People Organized to Win Employment Rights (POWER), Causa Justa/Just Cause, the women’s programs of the Day Labor Center, and similar organizations that have their base in working class communities of color. Childcare is a way that people with different forms of privilege around race or class or gender could be acting in solidarity with communities that are most impacted by heteropatriarchy and capitalism and as a way to support families more broadly to come into movement spaces, and to support women’s leadership in particular. The flip side is that there is still a lack of commitment to childcare in the left and in our movement. Even some of the women that we would be working with would have to struggle within their organizations to get resources for child care. Child care is the first thing that people cut out of their schedule when they get “too busy,” and you would have a lot of conversations with people about well, you’re not too busy, it’s a matter of priorities. You’re making a political decision to deprioritize it. Once a month? Almost anybody can do that. But it has to be a priority. And why is this not a priority? It was not just about solidarity work. It was about building with these young people. I got to work with young people over the course of many years and then see them grow up and turn into youth organizers. I learned a lot around how important it is not just to support women’s leadership but to create spaces where entire families can be a part of movement work in different ways. If we want to build movements that are broad as well as deep, and that reflect our communities, we have to provide for our children in deep and meaningful ways. Parents feel tremendous responsibility for children, and will not lightly entrust them to a collective process of any kind unless they are confident that the children will be safe, nurtured, appreciated. This means different things in different communities, but includes safety from the police, knowing about food allergies and other health situations, and appreciating each child’s unique mind and spirit. A sense of humor and willingness to learn are a basic requirement. What institutions can inspire this level of trust? First, there must be common goals besides care for the children, some kind of collective intention to which people feel and are held accountable. That is necessary, but not sufficient. Many radical organizations in the 1970s and 1980s had common goals (the usual language was “principles of unity”), but most did little or nothing to deal with child raising as either a practical or a political problem. The lesson we take from our experience in PFOC is that the collective intention must be feminist and focused on community building as well as narrowly “political.” Community building involves a lot of taking care of each other and a lot of mundane work: helping with each other’s living conditions, dealing with unequal incomes, accommodating disability. It’s a lot of the work that has traditionally been “women’s work,” and it needs to be the work of everyone in the community if we are going to be practicing feminists— which is another way of saying caring human beings. If our political work makes us “too busy” to build our community, we can be sure that taking care of the children will be seen merely as one task among others, and that people who are not parents will find themselves “too busy” to fulfill their child care responsibilities. Yet if we see the direct link between building strong communities and our broader political goals, we can appreciate the importance of collective childcare. If the collective is committed to the kids, then parents face the opportunity to let other adults into the lives of their children. Some will welcome this; for some it will be a challenge. Current “attachment parenting” ideology reinforces parents’ understandable anxiety about their children and dovetails with the pervasive climate of fear fostered by our increasingly militarized/policed society and its media minions. Parents may not realize or prioritize how much shared child raising means for the adult non-parents. The feminist politics of the collective necessitates discussion of how much non-parents and parents and their children can gain from the support of a bigger community. And then non-parent adults have to sign on and step up, to see ourselves not as “helping the parents” (echo of men “helping with housework”) but as establishing serious relationships with parents and children, for ourselves as well as for them. Our collective commitment to our children in PFOC has made us all, women and men, gay and straight, much more conscious of the importance of the work of social reproduction and the value of community. We strive for egalitarian relationships in our families. We have a web of comradely relationships with each other based on mutual respect. We are caring for grandchildren and helping each other with the hardships of aging; we do child care as solidarity work with other organizations; and we see ourselves as part of the project of envisioning a world worth living in. 2. ↑ Although I talked to many former members of PFOC and our children, this is my personal summary and not a collective assessment. Mickey Ellinger is an activist in Oakland, California. She has taught college classes and worked in a print shop, as a system administrator, and a freelance writer.